Preheat oven to 350, then roast almonds on a rimmed baking sheet for approx 10 minutes or until fragrant and just beginning to turn golden brown. Place roasted almonds in a food processor and process for a minute. Scrape down the sides, close lid and continue to process. Add salt and oil. Process for another 10 minutes or until smooth. Transfer almond butter into a jar. Seal with a lid and keep refrigerated for 2 weeks. 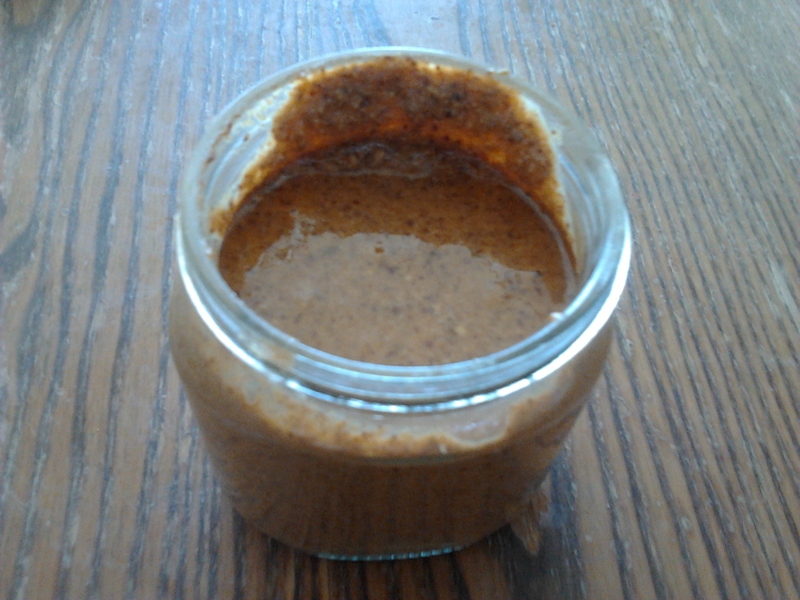 This entry was posted in Gluten Free, Vegetarian and tagged almond butter, Homemade Almond Butter, toasted almonds. P.S. : In case you are wondering, I did not include nor make a pie crust for this recipe. I felt like being remiss in not providing one. Preheat oven to 350 degrees F. Blend everything (except the chocolate chips) very well in a good food processor. Mix in chips, and pour into an greased deep dish pan. 35-40 minutes. Let stand at least 10 minutes before removing from the pan or cutting into slices. This entry was posted in Breakfast, Desserts, Vegetarian and tagged blondies, deep dish, deep dish blondie pie. Most people associate fruit salad with dessert. At least I do anyways. Very seldom is fruit salad thought as a salad. Yes there are salads made in many variations with some fruit embedded in it. A while ago, I was eating out at a cafe with an old acquaintance. When she ordered fruit salad, she was shocked when the waiter asked her which dressing she would like to go along with it. Dressing for a fruit salad doesn’t seem as unusual as it sounds. I made fruit salad dressings using yogurt, honey, and a bit of lemon juice. For this tropical fruit salad recipe, I decided that a salad dressing wouldn’t be necessary. 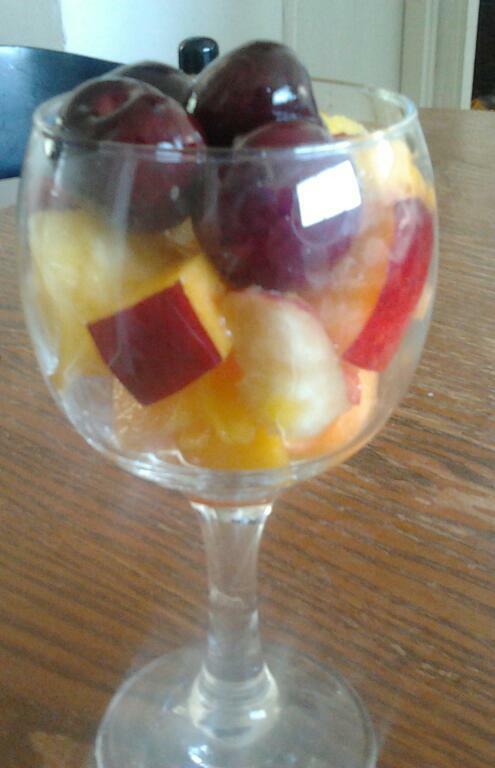 And yes, eating cut up assorted fruit is much more preferred as a dessert to me. Fruit is a healthy alternative to satisfy your cravings for sweet things and appease your sweet tooth. I’m always delighted when tropical fruit is in season. Made from cantaloupe, pineapple, mango, peaches, and cherries, this tropical fruit salad is refreshing, zingy and perfect for a hot summer day. You don’t have to travel very far to enjoy a taste of tropical paradise. Combined with a mixture of local and tropical fruit, this tropical fruit salad makes a great big bowl, big enough to feed a crowd so it’s perfect to bring to a picnic, potluck or to serve at a backyard BBQ. This is easy enough for anyone to make – if you can use a knife, you can make this salad. You can choose from your own combination of fruit for this easy fresh fruit salad. Feel free to add papaya, starfruit, kiwis, melon, bananas, coconut shavings or other berries if you find any. If making it for a party, you should consider serving your fruit salad in a pineapple or watermelon boat. Layer them in a wine or tequila glass for a touch of elegance. Or just casually serve it out of a salad bowl. Simplicity is one of my strong points after all. Place all the fresh fruit in a mixing bowl. Toss in some dressing if you prefer. Garnish with coconut flakes if you choose to. Serve at once. This entry was posted in Desserts, Gluten Free, Salad and tagged dessert, fruit salad, salad dressing, summer fruit, Tropical Fruit Salad. Akin to Nutella and any nut spread, peanut butter is an item that you can easily and inexpensively make in your own kitchen, since it does not require a lot of ingredients. Making your own peanut butter will also provide a healthier alternative to the commercial, store-bought kind, as homemade peanut butter will be free from preservatives and artificial flavors. A physician from St. Louise invented peanut butter in 1890 to provide his patients with an easy-to-digest, high protein food. Several dozen commercial brands of peanut butter were on the market by 1914, and in 1923 a process was invented to keep the oil and peanut butter from separating. Peanut butter is a blend of ground shelled peanuts, vegetable oil and salt. The advantages of making your own peanut butter is that you have full control over the amount of salt or honey you want to add. While some people like peanut butter crunchy, I have a stronger preference to smooth peanut butter. All it takes is some roasted unsalted peanuts, a food processor and 15 minutes of your time. If you can find a good, inexpensive supply of peanuts, making peanut butter may help save money in the long run while providing you with your own tasty batch of homemade peanut butter. You can always roast your peanuts. Just bake them in a 350 degrees F oven for 6 to 8 minutes, shaking them every 2 minutes to ensure that they don’t burn. Of course, the shelf life expectancy and supply of homemade peanut butter would be shorter as compared to its branded counterparts, unless you have family members with peanut allergies. You can add a bit of honey to sweeten it. If you decide on salted peanuts, I would not recommend adding more salt. Homemade peanut butter should be refrigerated after opening and will last 6 months this way, while other commercial brands will last as long at room temperature. Pour roasted peanuts in a food processor with a metal blade attached. Add the peanut oil. Cover the bowl with the food processor lid and chop the peanuts continuously for 2 to 3 minutes or until the mixture forms a ball. Scrape peanuts down from the food processor bowl into the bottom, as needed, when processing the peanuts. Continue processing the mixture until it is of your desired consistency. For smooth peanut butter, you may have to process the mixture for a longer period. Add the honey and salt if needed. 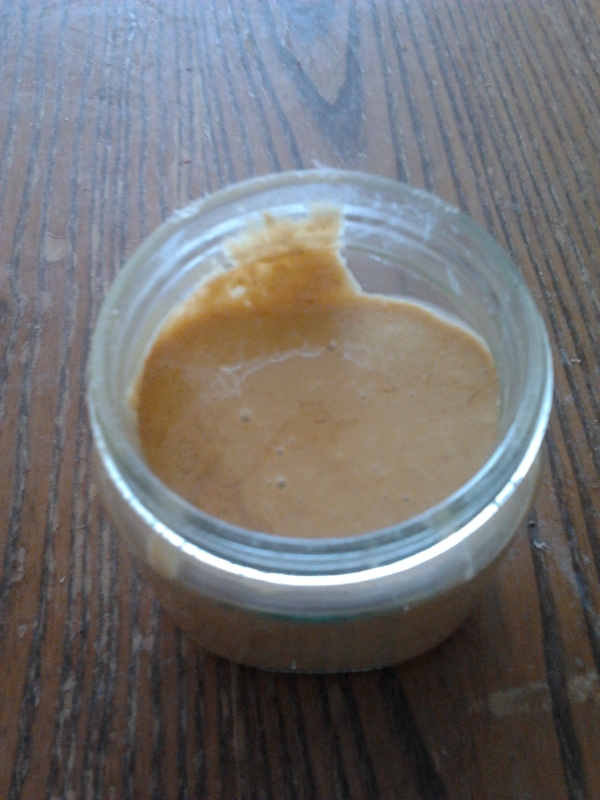 Transfer peanut butter into a jar or air-light container. Store in the refrigerator for a day or two so it can set in to a lovely thick peanut butter paste. This entry was posted in Gluten Free, Vegetarian and tagged Homemade Peanut Butter, Peanut butter, unsalted peanuts. I grew up on French toast. I had it almost every Sunday morning for breakfast. Truth be told, I never cared for French toast. It was either too eggy or too dry. I would often skip out on French toast despite my mother’s protests. I’d sooner prefer a bowl of soggy cornflakes if I wasn’t feeling too lazy to whip up a batter of pancakes for myself. French toast is a breakfast dish made of bread, eggs, and milk. The bread is soaked in eggs and milk. Sometimes a bit a vanilla extract, cinnamon, and sugar are added to the egg mixture. French toast is mostly served as a sweet dish along with fresh berries, topped with maple syrup or powdered sugar. Thick slices of stale bread is recommended for making French toast as it can absorb the liquid without getting too soggy. I was feeling adventurous and a bit bored one morning. After not having French toast for a while, I decided to give it another chance. I adapted a healthier and non-dairy version. I substituted milk for orange juice. You can use soy or almond milk as well. Rather than using whole eggs, I used egg whites. To add excitement to this dish, I used Nutella spread and sliced bananas. It was simply divine and a brilliant idea at that. Introducing French toast and a sandwich to each other is combining two of the best worlds together. You get a crispy exterior with a gooey filling on the inside. If you are looking for a healthy breakfast idea that you and your kids will love or to beat your morning grumpiness, this Nutella Banana French Toast Sandwich may be the right solution for you. I also happen to have had a irresistible craving for some Nutella spread that morning which turned into a breakfast inspiration. If you have a nut allergy, you can use chocolate spread. This variation of French toast is my favorite by far. Not only is this Nutella banana French toast sandwich decadent but it’s practically guilt-free so long as you make your own homemade Nutella. Beat egg whites, orange juice, vanilla extract, and cinnamon together in a shallow bowl. Whisk until well blended. Use bread slices to make 4 Nutella banana sandwiches. Dip each sandwich in the egg white mixture and coat evenly. Grease a non-stick skillet over medium high heat. Fry until brown on both sides, flipping the bread when necessary. Serve hot with maple and fresh berries. This entry was posted in Bread, Breakfast, Vegetarian and tagged breakfast, French toast, Nutella Banana French Toast, Nutella spread. While some people may beg to differ, I still insist that its hard to find good quality juices where I live. Tropicana was the closest thing to good fruit/citrus drinks. I particularly enjoy drinks made of freshly squeezed fruits. Now that I am able to make these fresh fruit drinks from the comfort of my own home, I no longer have to worry about not having anything to drink in the mornings. Sometimes a break from my usual morning coffee routine can be very much appreciated. Plus there is no concern of added sugar or preservatives homemade morning drinks. 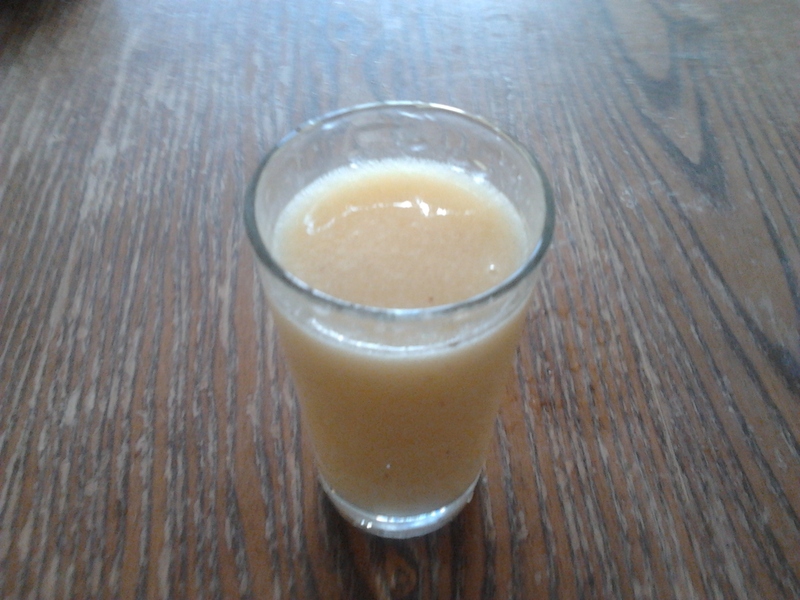 I made a peach mango drink for myself. I couldn’t think of a better way to kick-off the morning other than with a cup of peach mango drink. I chose peaches and mangoes as they are in season. A bit of orange juice adds some pizazz to this drink. If you don’t like pulp in your drink, just simply use a strainer. As a kid, I couldn’t think of anything more irritating than pulp in my juice. I happen to enjoy drinking fruit – not fruit juices, which are very high in sugar and low in fiber, but whole fruit blended into a smoothie or a drink. You can pack a lot of fruit into one of these drinks, so if you’re having trouble getting your daily servings, homemade drinks might be your answer. Moreover, mango is a great way to utilize in drinks and desserts. Just be sure the fruit you use is really ripe and sweet. The riper the fruit is, the easier it will blend. Place all ingredients in a blender and blend till smooth. Add a bit more water or orange juice if too thick. Strain with a sieve. Serve chilled. This entry was posted in Drinks, Gluten Free, Vegetarian and tagged mango, morning drinks, peach mango drink, ripes peaches. This Chocolate Lover’s Brownie Tart is a great dessert that chocoholics, parents, children, and those with a sweet tooth can compromise on. And it’s nearly not as complicated to make. Oh, did I mention that there are no eggs added at all? Vegans can breathe a sigh of relief. Tasty chocolate vegan and soy-free desserts do exist despite what some skeptical dessert fanatics may say. 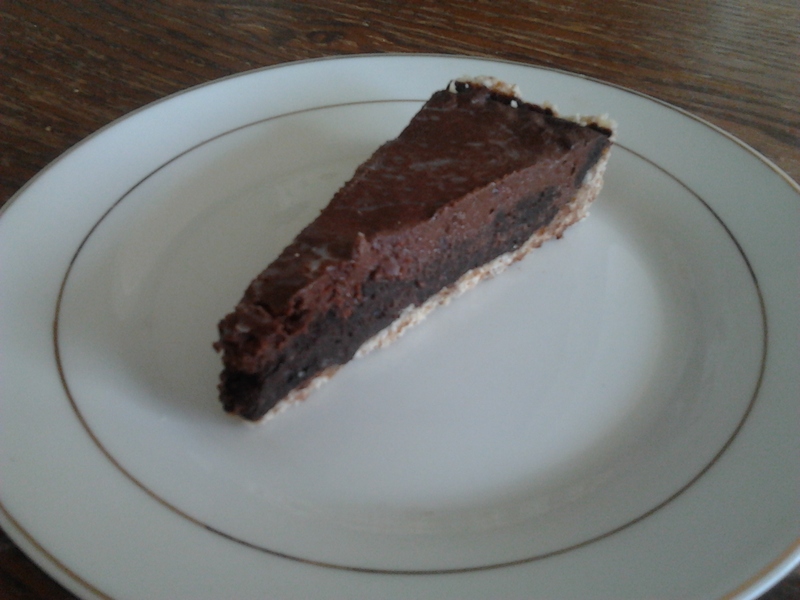 This vegan brownie tart is rich, fudgy and dense. They are not too sweet but have a strong chocolate flavor. You can recreate a gluten-free version if you choose too. Or you can leave out the ganache and serve this tart hot along with a scoop of vanilla frozen yogurt. For the cookie crust: Pulse ingredients in a food processor till they are coarse and crumb-like. Press up against a greased 9 inch tart pan. For brownie filling: Place all ingredients in the food processor except for the chocolate chips. Process till well combined. 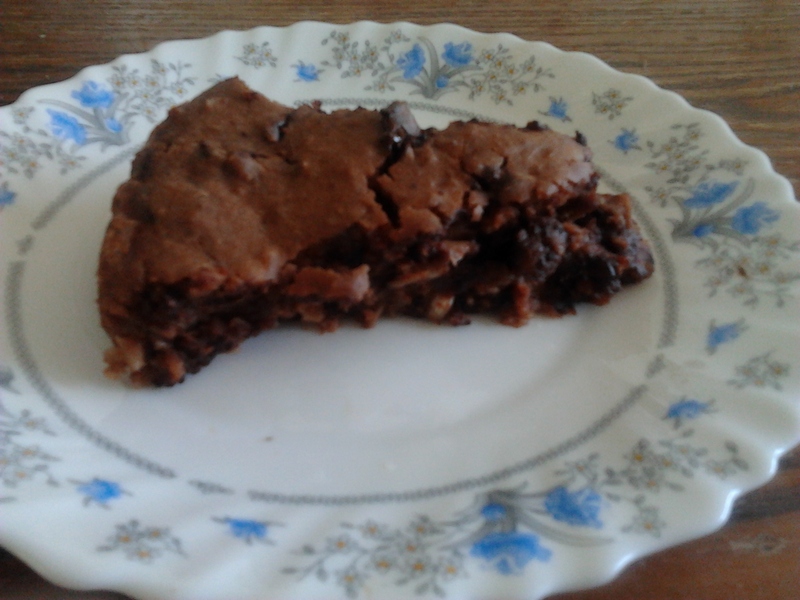 Melt chocolate chips and fold in brownie mixture. Transfer mixture to the tart pan. Bake for 27-30 minutes. Remove and allow it to completely cool. For the ganache: Place chocolate pieces and spread in a large bowl. Heat milk on medium high until it comes to a boil. Remove from heat and immediately pour milk over chocolate and stir until completely mixed and glossy. Allow ganache to cool before pouring over cakes as a glaze. The longer you allow the ganache to cool, the thicker it will set. This entry was posted in Desserts, Vegetarian and tagged brownie layer, chocolate ganache, Chocolate Lover's Brownie Tart, Pie crust.